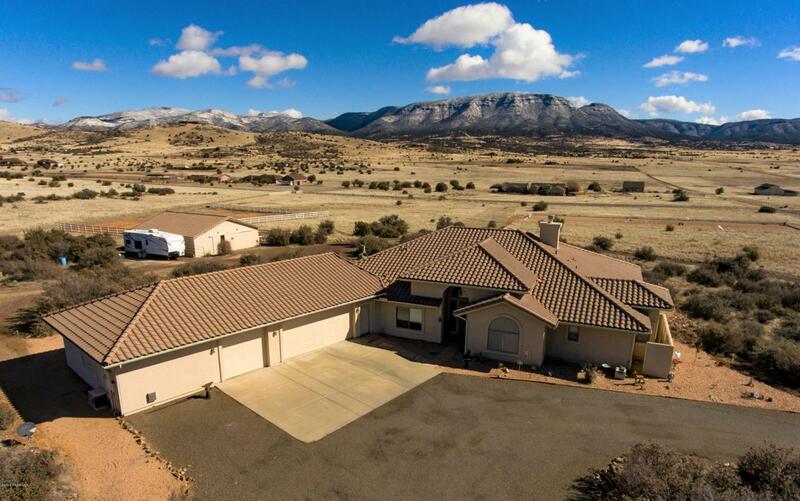 Outstanding 11 Acre Horse Property with a VIEW & a Booming 8GPM Well in Prestigious/Gated ''Prescott Ridge'', (Arguably the Best Kept Secret in the Prescott Area) with sensible CC&R's, PAVED ACESS, & located less than 4 Miles from the newly Renovated ARIZONA DOWNS Racetrack !!! This Custom Ranch features a 2872 Square Foot/One Level, Open/Split Floor Plan with 3Bedrooms, 3Bathrooms, and 4CarGarage/Workshop + Den, Great Room Concept, Formal Dining, 17'' Tile & Hardwood Floors in Wet/Traffic areas, Stain Grade Solid Wood Doors throughout, Zoned Heating & Cooling (w/lined/sealed Ductwork + Hepa Filter) Heat-a-lator Wood/Gas Fireplace w/Stacked Stone Chimney Face, High Ceilings, Plant Shelves, Art Niches, & Upgraded Lighting throughout. CONTINUE:The Kitchen is well appointed with Oak Cabinetry, GRANITE Countertops, NEW Stainless Steel Appliances, Large ISLAND w/Gas Range Top, Breakfast Bar, & Large Pantry. Your New Master is Huge with Dual Sinks, Jetted Garden Tub, His/Her Walk In Closets, & access to 1500 Square Foot Paver/Patio/Courtyard out back with Lights Out VIEWS of Mingus Mountain!!! Additional quality features include a Large Laundry room with Upper and Lower Cabinetry & Laundry Sink, access to Powder Room from back Courtyard/Patio, Walk-in Closet in Bedroom #3 + access to back Courtyard/Patio ....38'x42' 4 Stall/FARM MASTER Steel Barn w/Turnouts, Tack Room + Hay Storage, a Full Blown "DRESSAGE Horse Arena", Parameter Fenced w/Automatic Gate,7 KW Backup GENERATOR, New 50 Gallon Water Heater w/Recirc, Water Softener, S-Tile Roof, Dog Run, 8'x20' Storage Building, & many more surprises you will see at your PRIVATE VIEWING !!! !